Buy Fitted Diapers at Etsy. Read about our fantastic Fitted Diapers! Our fitted diapers come in two styles to fit your needs: Quick Dry or Pocket. Both are wonderfully trim and fit under most clothing, while six total layers of hemp fleece or terry provide plenty of absorbency for your child. All fitted diapers are individually created with special designs stitched on the soaker or insert as a special surprise to brighten your day. You never know what details will be stitched into one of our fitted diapers - it may be hearts, stars, or another fun design; words like "Love," "Shine," "Hope," or a other encouraging words, or whatever else inspires my creativity. I enjoy adding these extra details and hope they make each fitted diaper a little more special for you! Fitted diapers do not have a waterproof layer so they need a separate diaper cover. For a quick change, try wool or fleece diaper cover clothing, or for even faster changes, try going coverless and maximize air circulation! Quick dry (aka QD) fitted diapers help you spend more time with your precious child rather than your diapers. Our special quick dry soaker remains outside the diaper body so it can be throughly cleaned and quickly dried; saving valuable laundry time. Each absorbent soaker is attached to the fitted diaper body with reinforced snaps which do not need to be unsnapped before laundering, saving even more laundry time. The professional grade resin snaps will easily withstand everyday wear and tear - but not boiling, so please don't make "diaper soup"! Because the quick dry soakers stay snapped to the fitted diaper body, folding clean diapers after laundering is a breeze! No more searching for loose soakers and doublers or trying to remember which diaper inside went with what diaper outside. Simply fold the wings in, turn the front up, and get on with your life! 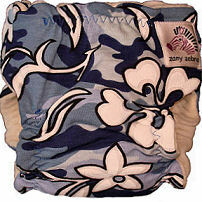 Zany Zebra pocket fitted diapers let you customize absorbency from diaper change to diaper change. Our pocket fitted diapers feature an opening in the back for stuffing with inserts, just like our "regular" pocket diapers. Our inserts are available in QD or trifold styles, both of which contain 6 full layers of absorbent hemp, bamboo or organic cotton. Pocket fitted diapers are a great choice because the insert comes out of the diaper for through cleaning and quick drying - often the inserts come out by themselves during the initial cold rinse so you don't have to touch them when they're dirty! And stuffing them after laundering is easy-peasy, thanks to the generous pocket opening. Our cloth baby wipes are super-soft and durable too. 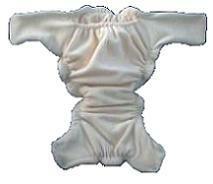 Our diaper inserts provider perfect absorbency in your pocket fitted diaper. For something really special, treat your little one to an applique diaper! Looking for more Information about Fitted Diapers? 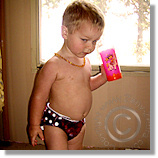 Visit the Fitted Diapers section of Cloth Diapers 101 for information about fitted diapers in general. Discover how to wash cloth diapers and get them really clean. Feel free to contact us with any questions about fitted diapers or cloth diapering in general. We're happy to help you learn about fitted diapers, and everything cloth diapering!